Looking for more inspiration for your short hair? You’d like to change a little something about it but don’t want to consider growing it out longer? We know what you mean, and you’ve come to the right place. We’ve browsed and ranked through an entire collection of trending men’s short hairstyles and selected only the top 8 style we thought you will like. Some of them are pretty tame, some are woke and bold, some are colorful, artificially or not, some require more styling and some are wild and free. We think we have a little of everything in this neat collection of the best men’s short hairstyles, and hope you find inspiration here for your own style. What’s really great about this short and relaxed hairstyle is that it’s great for men with thin hair who crave more volume. Its length and the layered structure are ideal for creating a natural aeration to hair, creating the illusion of thickness and volume. Also, the slightly scruffy look has just the right touch of careless, while the haircut still remains safely on the neat and groomed side of things. If you’re looking for a tamed short haircut, this should be your first choice. 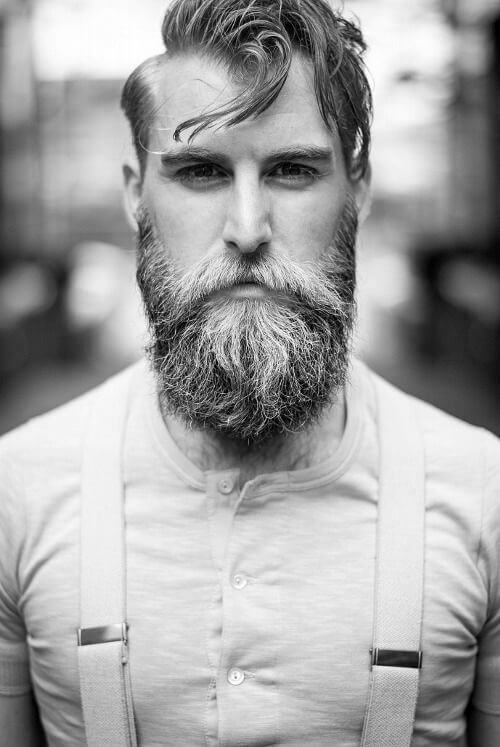 Full beards have been all the range these past few years, ever since the lumberjack look that took the hipster scene by storm and eventually overflowed into neighboring sub-cultures as well. 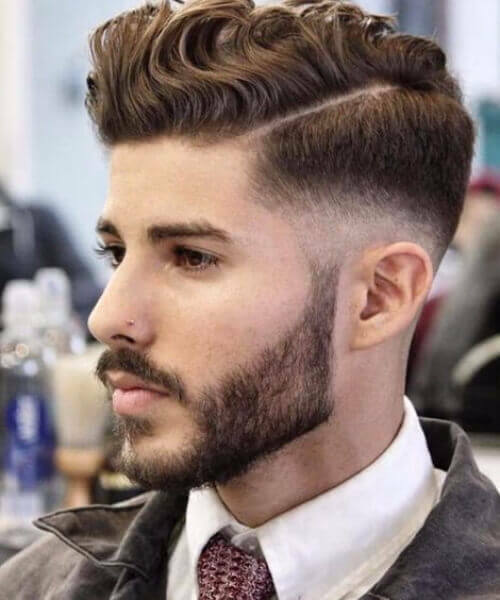 This is one of the men’s short hairstyles that complements the full beard perfectly: the slightly long bangs swept to one side, casually falling over the forehead are amazingly well-balanced. It provides the ideal mix of wild and tamed, perfect for the modern contemporary man. 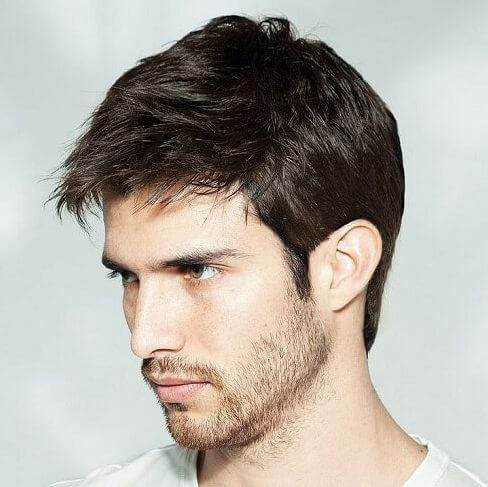 A tamed, classic look, as far as mid-fades are concerned, this stylish top haircut looks great with dark-colored hair, as you can notice from the picture above. If you find a talented hairstylist who is capable of giving you this look, you will probably stick with the haircut for a long time to come. 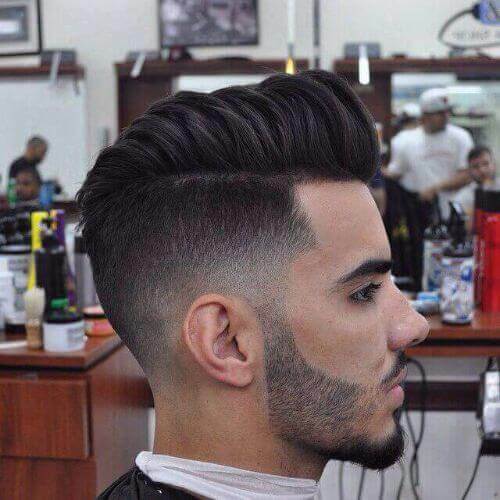 A fade and a hard part with a side-swept longer top is always a classy short hairstyle for men. But if the longer top is also curly, this makes it even classier and more remarkable. If you think your natural hair structure would be up for this, you should totally give it a try. This style is flattering to almost any type of face, and it’s among the trendiest men’s short hairstyles of the moment. Ginger men are something really special. Maybe because the color naturally occurs so rarely, maybe because it makes someone stand out immediately, but it catches our eye like nothing else can. If you’ve been blessed to also have curly hair in addition to having it red, then our proverbial hat is off to you, sir. Now have the good sense of choosing a slightly overgrown hairstyle that will highlight your beautiful mane properly. 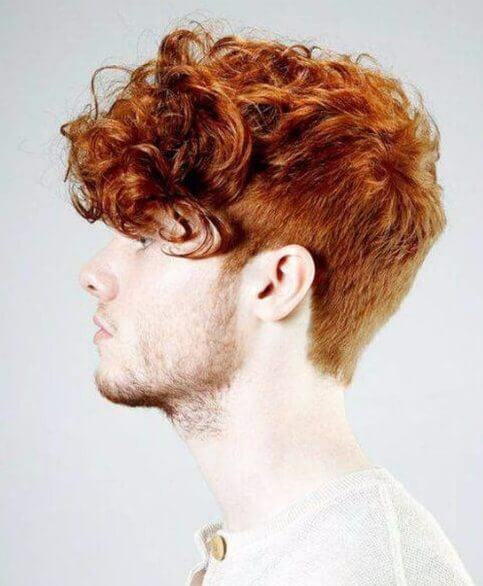 This one is an ideal example of what you should do with your hair if it’s red and curly. In fact, we think the hairstyle looks so good that it’s even worth dyeing your hair out for this, even if it’s naturally a different color. 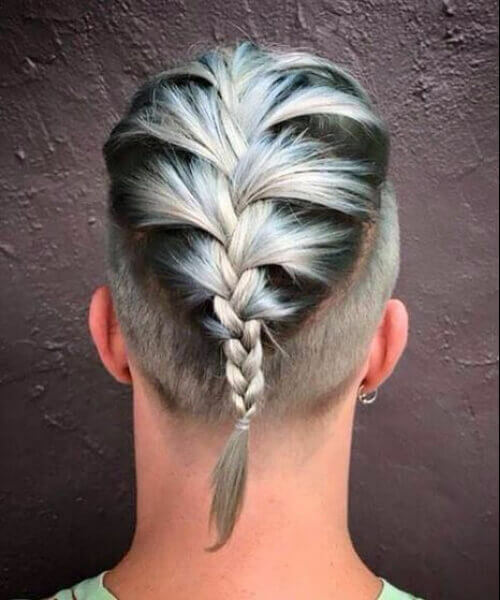 This particular take on braids (which are almost everywhere in men’s hairstyles nowadays) is great. It’s relaxed enough, short enough, cool enough (due to the shaved parts) but also checks in the braided department for an extra touch of pagan flair. If you are willing to bleach your hair and dye it gray for the added effect, go for it. But rest assured that the hairstyle would work well on any hair color, not just the one pictured above. The 90’s are back and provide inspiration for a ton of different things, from music to clothes and hairstyles. 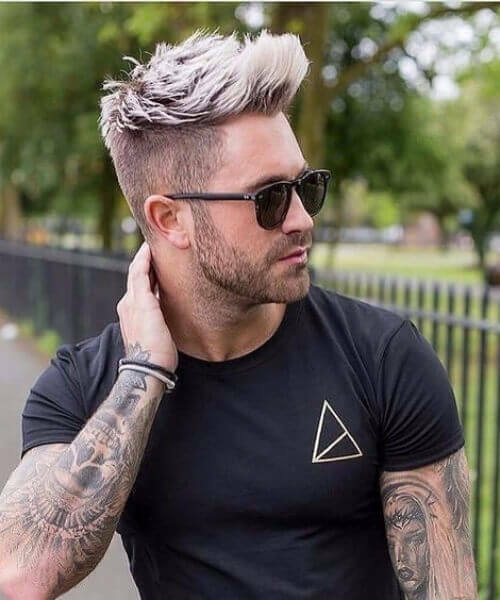 This short haircut with frosted tips is our favorite, and its longer wild style tips with faded sides also bring it into the current era. It is 90’s inspired, but not completely belonging to those years. If you’re willing to try it, rest assured that it’s easy to style and maintain, and will help you seem as laid back as ever. You will notice blue touched hairstyles for men popping up more and more in the following time. To paraphrase a famous movie title, blue is the hottest color. This particular take on blue is tame and pretty classy. 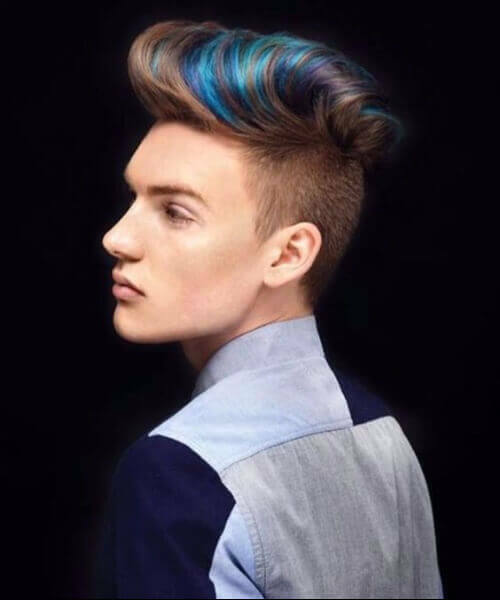 A faux hawk hairstyle is always in, and streaking it with a few different shades of blue, only every here and there, is a pretty contained approach. Nonetheless, this men’s short hairstyle stands out beyond any doubt. It has a vibrant, youthful air and it favors the bold. Which one of these men’s short hairstyles would you be willing to try?